Last month, diners at the Pine Beach Hotel in Yeppoon, Australia witnessed something that made them lose their appetite. While enjoying their meal, a man drove by in a truck trailing a limp dog behind it. The dog had somehow fallen out of the man's truck bed but the driver did not notice or care and kept moving along. 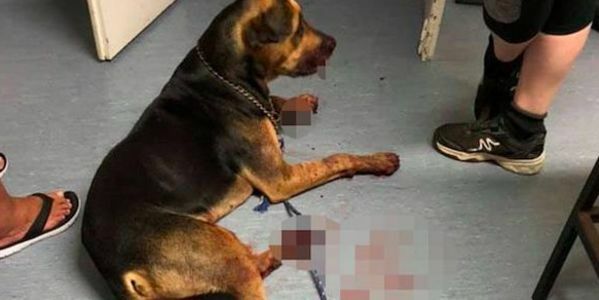 As the driver roared around the corner, the dog's collar snapped, leaving it in a pool of blood in the middle of the street. After it gathered its strength, the poor dog even tried to chase after the truck and the man who had abandoned him. Kind bystanders then jumped in to rescue the poor pooch, rushing him to the vet. Unfortunately, it wasn't enough and he died overnight. And in most parts of Australia, it is illegal to allow your dog to travel in the back of an open vehicle with RSPCA Australia advising that people should ensure "their dog's restraint is long enough to allow him to stand and lie down, but not so long that he could jump or fall over the edge of the moving vehicle." The cruel dog owner who dragged and then abandoned his dog clearly didn't follow these recommendations. Please sign the petition and tell the Yeppoon Police you support their search for this irresponsible pet owner. Tell them to find him and charge him with animal cruelty.